St Mary's Cathedral is the spiritual home of Sydney's Catholic community. 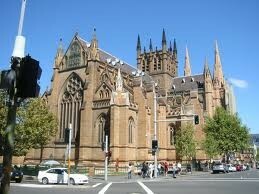 It is the seat of the Archbishop of Sydney, and stands on the site of the first Catholic Chapel in Australia. Constructed in local sandstone, the "Gothic Revival" style of its architecture is reminiscent of the great medieval cathedrals of Europe. St Mary's is not only a great legacy from the past, however, it is a vital part of the present spiritual and cultural life of the city and the nation. The Cathedral is dedicated to the Blessed Virgin Mary, under the title of Immaculate Mother of God, Help of Christians.